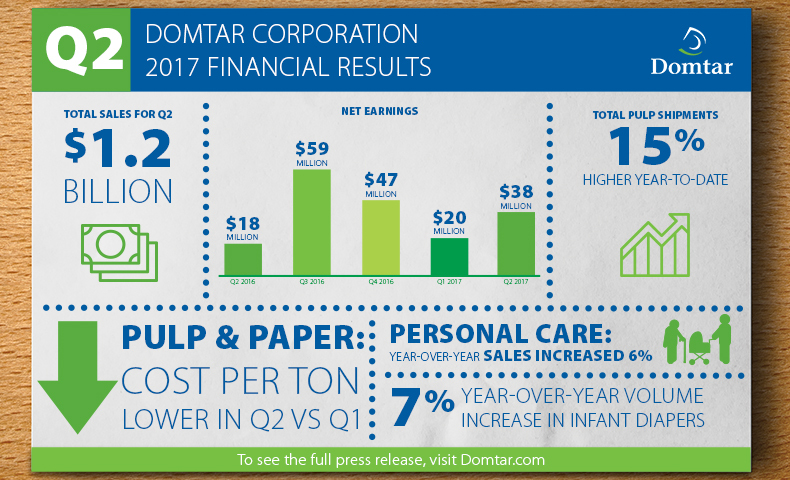 Domtar reported net earnings of $38 million ($0.61 per share) for the second quarter of 2017, compared to net earnings of $20 million ($0.32 per share) for the first quarter of 2017 and net earnings of $18 million ($0.29 per share) for the second quarter of 2016. Sales for the second quarter of 2017 were $1.2 billion. Operating income was $64 million in the second quarter of 2017 compared to operating income of $42 million in the first quarter of 2017. Depreciation and amortization totaled $79 million in the second quarter of 2017. For the remainder of the year, we expect our paper shipments to be in-line with market demand. Our pulp shipments should be higher due to the ramp-up of the Ashdown fluff pulp line, while mix should continue to improve as we convert to more fluff pulp sales. In Personal Care, investments in advertising and promotion, in addition to new customer wins, should drive higher sales, while raw material costs are expected to increase marginally. For more information on the Domtar second quarter financial report, please read the full press release. All information from the Domtar quarterly financial report is in U.S. dollars, and all earnings per share results are diluted, unless otherwise noted.